Also known as Stenogramme interrupta and Stenogramma interrupta. 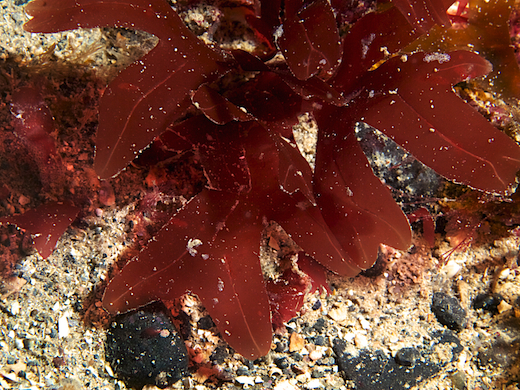 Description: Cartilaginous, flattened, bright red fronds, to 70 mm high, shortly stipitate from discoid base. Lamina fan-shaped, more or less dichotomously divided, segments about 10 mm wide, with rounded apices, margin usually smooth, rarely proliferous. Reproductive structures often occurring in a clearly visible, often discontinuous, 'midrib' over the surface of the fronds. Habitat: On rocks, stones, pebbles; almost exclusively subtidal, southern and western coasts, occasional. Similar Species: Phyllophora sicula; Rhodymenia pseudopalmata; Schottera nicaeensis. Site © M.D. Guiry 2000 - 2019. Important copyright notice: all text, design and photographs on this site are copyrighted by M.D. Guiry unless otherwise stated and all rights are strictly reserved. Click here for copyright information and contact. Website design: 249 Design Studio. Site maintained by M.D. Guiry (michael.guiry@nuigalway.ie). There have been 8736809 page loads since 1 January 2014 on 25 April 2019.